If your school had a student-friendly environment for teaching children about metacognition, children could develop their skills in self-reflection, paying attention, emotional regulation, and cognitive flexibility. Although emotion and cognition originate in different parts of the brain, they interact and play a powerful role in learning and memory. According to neuroscientists like Eric Jensen, priming the brain for particular states of engagement -- such as curiosity, intrigue, surprise, suspense, a bit of confusion, skepticism, and the feeling of safety -- prepares the mind to learn. Furthermore, incorporating emotion into our instruction and content supports long-term memory. This might not be news to teachers, but not enough students know how to optimize their brain for learning. That's why every child should have the opportunity to explore neuroscience in a brain lab. What Is a Brain Lab? What Is Its Purpose? Students could be assigned personal folders with choices of lab activities. Meanwhile, teachers might choose a brain topic each week or month, such as stress, memory, or exercise, movement, and the brain. Some brain-related topics could take advantage of recent research and pop culture. For example, one module might include activities related to the ideas expressed by Pixar's film Inside Out in order to show how the brain processes thoughts, feelings, and experiences. The movie teaches a fundamental principle about the mind: We can control how our brain reacts to life's challenges. Students can learn to alleviate sadness, increase joy, or activate anger when necessary. 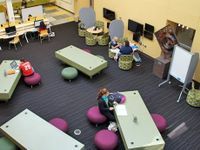 Brain lab would be the space to explore how all emotions connect to students' lives and interests, as well as the academic curriculum. Another key element of the brain lab curriculum would be the study of how students can adjust their thinking to positively reframe events originally perceived as negative. The understanding of neuroplasticity, defined as the brain's ability to change or adapt based upon experiences, can help students become better and smarter while learning about this important concept, as depicted in the Backwards Brain Bicycle. This short video demonstrates how neural pathways that are traveled frequently become hardwired into habits difficult to change without deliberation and effort. After viewing the video, students could share one undesirable habit that they will intentionally address during the year. With those fundamental principles about neuroplasticity internalized, students could study new ways of memorizing and understanding information for a test, or ways to broaden their perspective about peers that were previously thought of as aggravating. A posted list of choices for enhancing brain development can be aligned with curriculum standards. For example, if students are learning factor trees in math, they could extend this task by using a similar protocol for creating a family ancestry tree. In order to teach inference making in language arts, instructors could bring a tattered house slipper or other worn object from home, show a video clip, or share a story without an ending. Learners could create an inference with a written or cartoon ending based upon the objects and videos presented. As we learn more about neuroscience and its relationship to teaching and learning, we can add more resources to the brain lab and help students take ownership of their brain development. What would your brain lab look like?